Whether it’s the lush landscapes, tropical beaches or vibrant culture that you fall for, this exotic Indonesian locale is sure to capture your heart. After these five experiences, you’ll never want to leave Bali. Don’t let the pre-dawn wake-up call dissuade you! This nature-infused trek, which begins at the base of the active volcano several hours before sunrise, is a steep 1,700 meter climb to the top. At the peak, guides prepare a breakfast of boiled eggs, banana sandwiches and hot drinks cooked in the heat of the steam vents lining the volcano’s crater. Meanwhile, you can bask in the sun’s warm rays welcoming a new day in beautiful Bali. 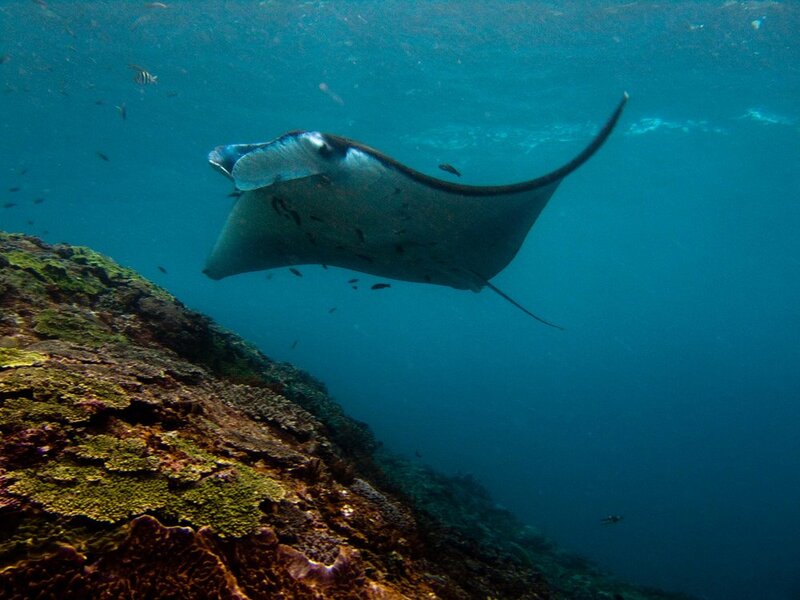 Ocean lovers will revel in this incredible adventure snorkeling or scuba diving with manta rays off the limestone coast of Nusa Penida at Manta Point. These graceful giants glide effortlessly around this “cleaning station” and the clear blue waters make for a great up-close-and-personal undersea experience. With a 10 to 15 foot wingspan, these magnificent, docile creatures dwarf any swimmer and leave visitors feeling humbled and awestruck. Need a break from the bustle of Bali? Spend a few days on one of the three Gili Islands (Gili Trawangan, Gili Air, Gili Meno), where you’ll find bliss biking around the islands or soaking in the sunshine on the beach with a drink in hand. Of all the temples in Bali, you’ll probably find your Eat, Pray, Love moment here. People from all over Bali seek the sacred spring water that feeds this Hindu-Balinese temple built in the early 10th century. Its namemeans “Holy Spring.” The grounds are breathtaking, but the main attractions is its namesake, the holy spring pool. Before dipping into the crisp water, present your flower and incense offerings and pray to the gods. As you move down the row of fountains, pouring water over your head three times at each, the ritual cleanses your soul and renews your spirit. Get to know the locals at this Ubud tourist hotspot. Yes, it’s on everyone’s Bali bucket list, but for good reason. The monkeys that call this place home are cheeky, curious and hungry--so keep an eye on your belongings and come armed with bananas (available for purchase inside the sanctuary) and a good attitude. We’re all just monkeying around here. Take home a piece of Bali in the form of your new favorite outfit. There’s no better place for shopping than in the heart of beachy Seminyak. Don’t forget to stop in these five travel-inspired boutiques! Melbourne-bred Sarah Wilkinson designs boho-chic threads in this wanderlust-infused boutique. Find globally-inspired accessories and light, flowy clothing perfect for traveling through the tropics. You can’t miss this store’s brightly-painted exterior, but it’s what you’ll find inside that makes this boutique worth visiting. Here you’ll shop bold prints and comfortable resort wear. The store is also home to two other labels, Super Normal Collective and Mosey Loves Elvis. The artisan silver pieces found in this jewelry store evoke visions of oceanscapes and mountain vistas, transporting nomadic souls to faraway destinations even though each piece is crafted in Indonesia. Step into this bright, airy boutique to shop elegant designs to match any occasion, from afternoons poolside at the hotel to a romantic dinner by the beach. Flowy and feminine, this is the place to find the dress that will make you feel like a sophisticated goddess. For vintage-inspired trends, explore this fashion boutique that offers timeless wardrobe staples with a bohemian flair.